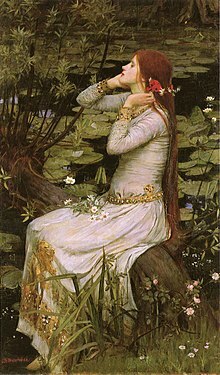 ^ For one example of praise, see "The Works of Shakespeare", in 11 volumes (Hamlet in volume 10), edited by Henry N. Hudson, published by James Munroe and Company, 1856: "This exquisite passage is deservedly celebrated. Nothing could better illustrate the Poet's power to make the description of a thing better than the thing itself, by giving us his eyes to see it with." ^ Taylor (2002, 4); Banham (1998, 141). ^ Gurr (1992, 193) and Showalter (1985, 80-81). ^ a b Showalter (1985, 80, 81). ^ * Tonkin, Boyd, "Singing in the chains: a tongue-tied heroine", The Independent, 16 January 2009. Accessed 29 April 2014. Charney, Maurice. 2000. Shakespeare on Love & Lust. New York: Columbia University Press. ISBN 0-231-10429-4. Gurr, Andrew. 1992. The Shakespearean Stage 1574-1642. Third ed. Cambridge: Cambridge University Press. ISBN 0-521-42240-X. Hattaway, Michael. 1982. Elizabethan Popular Theatre: Plays in Performance. Theatre Production ser. London and Boston: Routledge and Kegan Paul. ISBN 0-7100-9052-8. Showalter, Elain. 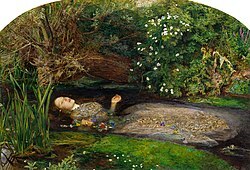 "Representing Ophelia: Women, Madness, and the Responsibilities of Feminist Criticism". In Shakespeare and the Question of Theory.. Ed. by Patricia Parker and Geoffrey Hartman. New York and Lonson: Methuen, 1985, pp. 77-94. Taylor, Gary. "Shakespeare Plays on Renaissance Stages". In The Cambridge Companion to Shakespeare on Stage. Ed. by Stanley Wells and Sarah Stanton. Cambridge: Cambridge University Press, 2002, pp. 1-20. Thomson, Peter. 1983. Shakespeare's Theatre. Theatre Production ser. London and Boston: Routledge and Kegan Paul. ISBN 0-7100-9480-9. Wells, Stanley, and Sarah Stanton, eds. 2002. 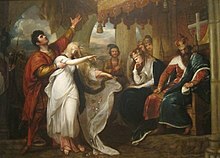 The Cambridge Companion to Shakespeare on Stage. Cambridge Companions to Literature ser. Cambridge: Cambridge University Press. ISBN 0-521-79711-X.